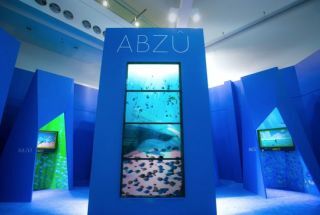 WorldStage partnered with ABZU to create a unique booth experience at the Electronic Entertainment Expo 2013 designed to make a splash. ABZU is a new underwater diving simulation game with an emphasis on peaceful interaction with aquatic creatures. Individual acts of ABZU are set in different areas of the sea, including caverns, deep oceanic areas, coral reefs and flooded ruins. In a convention packed with game titles highlighting combat, warfare and action sports, ABZU's booth at the Electronic Entertainment Expo 2016 (E3) was a sea of calm. The blue-toned booth, in the lobby of the West Hall of the Los Angeles Convention Center, had an underwater aesthetic. At the forefront a stunning tower of transparent Blackbird 55 displays, provided by WorldStage, captured visitors' attention with its graceful underwater imagery. Working with Eventmakers and NONdesigns, WorldStage installed a stack of four Blackbird 55 transparent 55-inch HD displays in a tower at the front of the ABZU booth. Visitors could walk around the screens and view from front and back photorealistic animations of schools of fish, a gliding shark and divers exploring the underwater world. "The Blackbird 55s worked beautifully for creating the deep water scenes," said Jessie McDaniel, account and marketing executive at WorldStage. "The very high transparency of the displays made it seem as if visitors were exploring the ocean, too." McDaniel notes that WorldStage has seen increased interest from clients in Blackbird display technology; Blackbird screens are available in 55- and 80-inch models. "We can't wait to see the ideas customers have for using them," said McDaniel. "Eventmakers and NONdesigns couldn't have made a better choice for the ABZU booth. The Blackbird transparent displays looked brilliant -- they really gave the illusion of being underwater." WorldStage also supplied 40-inch monitors for four gaming stations in the ABZU booth. The gaming stations were housed in 12-foot tall pods with sharp-angled facets representing the twists and turns of sea kelp. Sea life imagery was printed on the inside of each pod to depict scenes from the game; the ceiling of each pod was made of blue translucent acrylic with lighting simulating the sun's rays penetrating to the ocean floor.